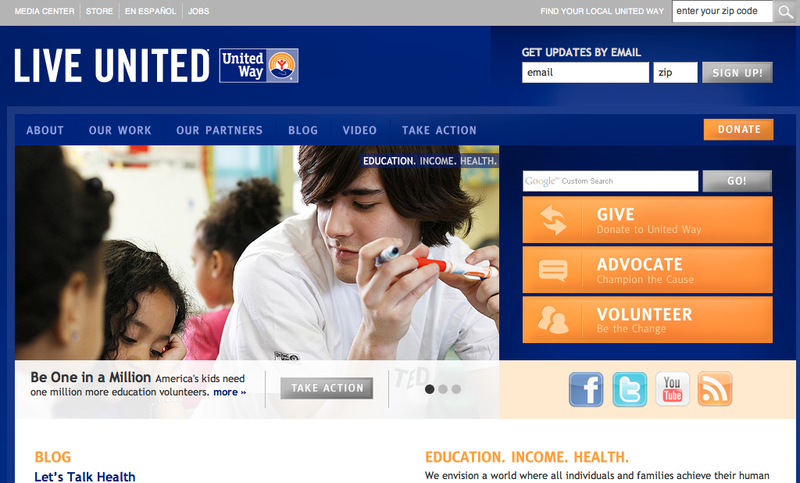 Screen capture from the United Way web site's homepage. 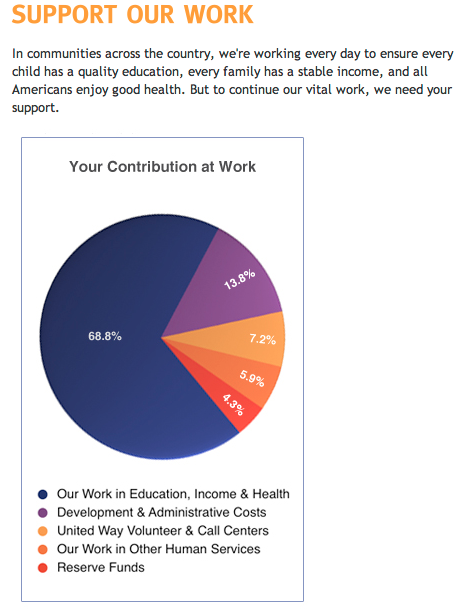 The home site is framed by a dark blue back ground, and dark blue navigation, which is difficult to see, but below that is a nice feature space, easy to see buttons of Give, Advocate, and Volunteer. It’s clear what they want visitors to do, but it takes a little bit of digging to find out what the organization does. Scrolling down reveals more white space, text links, photos, a blog preview, and social media icons. Orange is their accent color, which works nicely with the white and dark royal blue. Appears to be teens, college students, teachers, parents, politicians, community groups, and corporate partners. The ultimate goal of the site is to get visitors to volunteer, advocate, wear a “Live United” t-shirt, or, most importantly, to give a donation to support the goals of the organization. Those goals are to help individuals reach their potential through education, income generation, and improved health. The Live United team is doing basic social media, posting clever PSA’s to YouTube, and managing their blog, Facebook and Twitter. Subgroups such as Student United Way have their own Facebook pages. The blog offers an RSS feed. They have an email sign up, and a donate page, which processes donations with one click.